@rustyred – I think you were right behind me. I took a picture and tweeted it out too. 311 replied and said that it wasn’t the city but some utility company and that they would have it moved. It was gone this morning, so that was nice. If you were wearing Ibex and have an orange pannier, then yes, that was me. I also encountered a film crew hunkered down in the Clemente bike lane that morning, I was leery to approach a couple of hipsters crouching in the bike lane. Man I need to remember the date on Skirts and Dresses day. Gonna hafta hit the Goodwill. @rustyred – Off topic, but what camera are you pulling those ride photos from? It looks pretty awesome. @erink those are from a Contour Roam. They no longer make/support them. Hey, the cops are doing a great job of keeping cars from parking in the bike lane connector on 6th ave! This is on the main page, but it bears repeating: on bike to work day, actual count showed more than one in four vehicles during commuting hours were bikes. Wow. From Friday night’s Flock ride. A high point of the evening, for certain. This why bike lanes on one side of the street are unsafe. You are asking cyclists to ride head on in traffic and cars do not expcect them. Two lanes are needed, one on each side of the street (if it is a two direction street) with bicycle traffic traveling in the same direction as car traffic. Personally, I avoid the Penn Ave cycle lane when riding downtown. I’d rather ride one or two streets out of my way so I can travel with the traffic. If there had been bike lanes on both sides of the street, he would’ve hit both sets of bollards. If there had been cars in the northbound lane, he would’ve hit them, or forced them out of his way, just as he did the first riders in the lane. This is a demonstration of why 53′ trailers are inappropriate for Downtown streets, not bike lanes. I’m impressed he managed to make the turn without taking out the parked FedEx truck. And it is similarly impressive that these things pop right back up like that after getting crushed by a tractor-trailer. FWIW, I sent the video link to Kristen Saunders, too. I figure that she would want to see them in action. So, if people claim that Open Streets skewed it, take about 1400 off the count since a regular weekend day would have around 800 and were still left with nearly 23,000 trips which comes out to nearly 700-750 trips a day. Also, this was done in partnership with the Pittsburgh Downtown Partnership who I would think has little reason to skew the numbers in any way. Huh. Ride of Silence on the 20th didn’t skew the numbers. That looks like a lot of usage during the week, honestly, probably more than I would have expected. That “commuter pattern” is a cool find, as well. Is there similar data for EFT/Jail Trail and the other local segments of Three Rivers Heritage trail? haha. i do the same thing. I wonder what it does with the single bump from a unicycle hitting it, as I did several times on Sunday. +1 to trying to ensure I’m counted by the counters by slowing/speeding up on Penn. in the code. And we know how corruptible software people are…worse that bikers…. OK, honest question. Cyclist “A”, starting at 6th and rolling to 16th, would hit all the strips. How does that get counted, vs Cyclist “B”, starting at the Greyhound Station and rolling to 16th, and only hitting one set of strips? @iguana: Excuse me if this is too much for your reptilian brain (-: I imagine that the bike counter people have already taken such obvious issues into account. Is there any evidence that the numbers are inflated by a factor of 2 or 4? People, people, this is so easily resolved. I suggest than someone truly invested in this issue park themselves at one of the installations, for a day (ie 24 hrs), and count the traffics. I would recommend a 3-clicker counter so you can get inbound/ outbound/ car counts. We can then check these against the reported counts and compute the agreement (κ). Then we will know for sure. Well, to make legit we should probably get one of those LetterToTheEditor farts to show up and do a count as well. Maybe do it for a complete week, just to be sure. I would also suggest bringing some sandwiches and a comfortable chair. This is absolutely publishable, somewhere. The only way to get one of those guys offa their couch is to put a cold beer just out of reach, so they have to heave the lard up our of their seat to get it. Can we just point a camera at the bike lane and hook it to a recorder, then play it back at some speed and count people? It would take a lot less human time than having someone stand there all day. Indeed a camera is better solution. But the suggestion was more intended for committed participants in this never-ending Bike Lane battle of attrition. I personally would rather just wait a couple of months until letters show up complaining about how you never can find a share-bike when you need it, and why weren’t they installed in some obvious location or other. Later on we can have letters complaining about bicycle traffic jams and by what right do cars get to have so much space on streets. 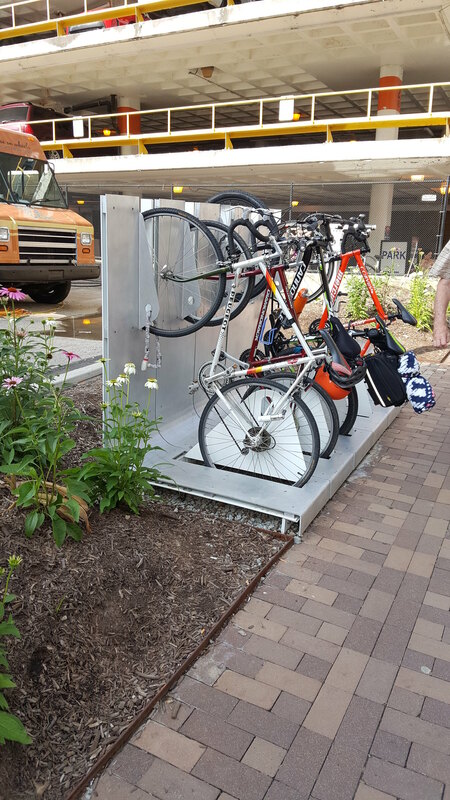 Still hate that bike rack, but at least folks are using it (and by the looks of it, doing a pretty good job of using u-locks consistently). Overall, ridership was sligthly down when compared to May, but given the weather we had, this was to be expected. That last weekend illustrates this perfectly. It basically rained all day on that Saturday, and the next day’s OpenStreetsPGH was significantly affected as well, as the numbers were cut in half. Though the latter may also be because people didn’t see the point of riding on the cycle track when they had the rest of the street available. Wettest June in 20 years, nearly identical ridership in the outer section. I noticed the counter in the 600 block was partially pulled up (damaged) last night when I went through. Who do we report this to? Regarding the 600 block, there was a period for about a week or so that they were doing utility work right on the section were the counter is. Granted, this work was done mostly at night, but it surely lost a few trips because of this. A drier July and a fully rolled out Healthy Ride should see these numbers go up. I just found this blog post from a local lawyer-cyclists that talks about mandatory use of bike lanes. It’s a good read. What got me looking was an encounter I had on the road next to the trail by the Duquesne incline over the weekend. An SUV crossed the yellow line and drove in the wrong lane to pass a long line of stopped vehicles which were turning into the parking lot. 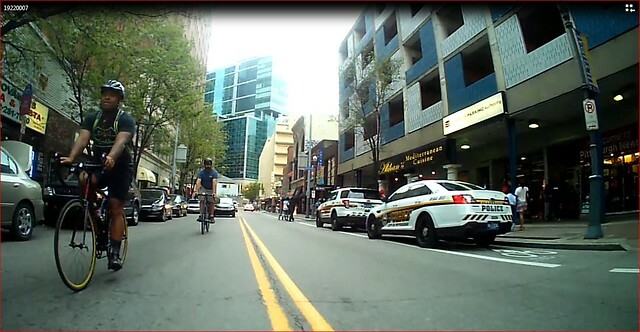 We had a brief standoff, but apparently it was my fault because I wasn’t using the bike lane.